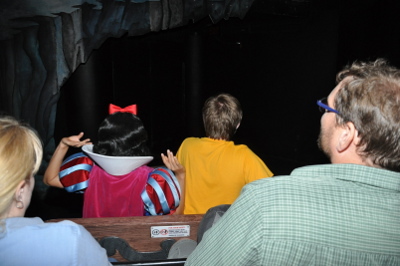 This is the third in a series of six blog posts about my son and his experience on the last night of operation for Snow White's Scary Adventures at Walt Disney World. To read the entire series from the beginning, start with SWSA Final Night - Prelude. Thank you for reading. Earlier in the week, a few days before the final night of Snow White's Scary Adventures, I had a telephone conversation with Disney cast member Stacey Patrone. We were discussing what might be possible for creating a Magical Moment for Benjamin on the last evening, and coordinating times and such. She couldn't give me any specifics, but we did arrange that whatever happened would be at 7pm. I was very careful to stress to her that my family did not expect Disney to do anything for Ben, and that we were extremely grateful for anything that they did do. My one concern had to do with expectations - I was a little worried that whatever they did, Ben might not seem like he was enjoying it. If you don't know Ben it can be kind of hard to read him, and he can also get overwhelmed if too many people are focused on him. I warned her not to necessarily expect anything like a Kodak moment, but reassured her that whatever she put together I was sure that Ben would enjoy in his own way. So there we were on Thursday night, just after 7pm and being led by Stacey and a couple other cast members to stand over in front of The Friar's Nook. Ben was in a happy mood, but kind of pulling us back over towards SWSA. He was having the time of his life, and wanted to get right back to it. After a few short minutes of waiting, a door opened and out came Snow White herself to come talk to Ben. All of a sudden, Ben got a huge smile on his face and started laughing hysterically. He was positively transfixed. That Kodak moment that I warned Stacey not to expect? Oh yeah, it was there in spades. 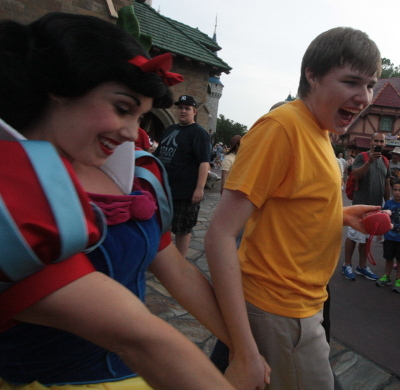 Snow White continued to talk to him as Ben very shyly took her hand, and then laughed some more. It was an almost drunken laugh, the laugh you hear from a baby when you play peek-a-boo for too long and they drift into that delirious-happy state. 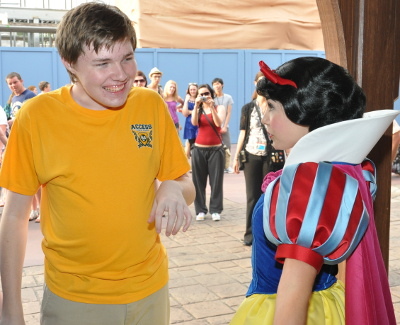 As Snow White talked to him about the ride, and about all of the dwarfs, Ben seemed to be absolutely glowing with joy. A crowd began to gather behind him, and I had to take off my glasses and dry my eyes. I can assure you that I am the manliest of men, and I am positive it was just allergies or perhaps a speck of dust that got in my eye. Whatever it was, it seemed to be spreading to everyone nearby. Not a dry eye in the house. This went on for several minutes and Snow White never let up, never broke character even for a moment. She knew how many times Ben had been on her ride, she knew what his favorite moments in the ride were, and most of all she knew how to keep him engaged and joyously happy. Eventually she invited Ben to go on the ride with her, and he gleefully agreed. Stacey led the parade with Ben and Snow White, Ben's mom, several other cast members (including two photographers), and myself. The crowd parted in front of us, and we were guided straight to the front of the line. The entire time, Snow White kept up with her unending improvised monologue and Ben kept up with his boisterous laughter. Soon we were in the mine cart, and one of the photographers joined us to continue snapping pictures of the encounter. Snow White would point out details of the ride, and Ben would alternately turn away from her and then spin back around and take her hand. The poor boy was fully twitterpated. Snow White gasps as the Witch is struck by lightning. Ben was pretty stricken as well. The ride ended, but the visit wasn't over yet. Stacey led us through the exit gate as the crowd cheered for Ben. I didn't know it at the time, but Keven Yee from MiceAge.com was standing there taking photos and he caught what turned out to be my favorite shot of the night. You can see Ben still electric with joy, holding Snow White's hand as the crowd looks on. 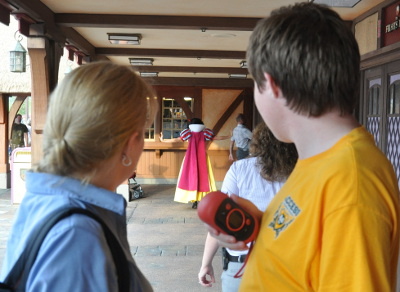 We were led back over to The Friar's Nook, and Snow White continued to visit with Ben for several more minutes. Stacey presented Ben with a CD full of photos from inside the ride, taken earlier that morning by one of the Disney photographers so that he would have some high quality pictures to remember the ride by. Altogether Snow White spent about fifteen minutes with Ben. The entire time he was enchanted by her presence, but even he knew it couldn't last forever. Finally Snow White bid Ben farewell, apologizing that she simply cold not leave Dopey alone in the cottage for very long and she had to get back to him. With one last kiss she whirled away and disappeared once again as Ben looked on. After Snow White was gone, Ben immediately turned to his mom. "Mama... I want... more Snow White... PLEASE!" Now, I haven't been on the ride quite as many times as Ben but I've probably been there for at least 3/4 of them. Most of them were pretty much the same, but I must say that ride number 3,459 was pretty exceptional. I thought to myself, wow - it just doesn't matter what else happened that night because it just couldn't get any better. And then it got better. I have tears in my eyes reading this part, and to think it got better? True Disney magic. I became aware of Ben's story a few years ago, and knowing this was the final week, I googled "snow white ride ben" to find out what happened with your family. Can't wait for the next segment! I can't wait to read how this turns out. I love this tale. It is pure Disney joy. I have told everyone this story - just magical! Although each time I told it, everyone hoped the surprise would be that Disney would keep the ride open for Ben! con -- Hold that thought. i have nothing but love and respect for you and ben. now, we need to get ben to disneyland to revisit snow white. We're working on that! Definitely not this summer, but hopefully sometime either in the fall or else next spring.